Whether your roof is in need of repair or replacement, or you are building a new home, now is the perfect time of the year to consider new roof installation. A new roof will not only improve the energy efficiency of your home, but it can also increase its curb appeal and overall value when you decide it is time to sell. Your roof is a fairly large investment, so it is important to find a professional and experienced roofing contractor to ensure that the job is done properly. In addition, it is also important to find and select the right roofing material for your home. Choosing a roofing material for your home can be overwhelming. Because your roof is a very valuable investment for your home, trying to find the right material can often be a challenge. There are a wide range of roofing materials that you can choose for your home. If you are in need of a new roof but aren’t sure what roofing materials are best, do not worry! In this blog, we are going to provide you with some tips on how to choose the right roofing material as well as some of the most common roofing types that our Glendale, Phoenix, and Mesa roofing contractors often install. The thought and decision-making process in choosing a roofing material is rarely never straightforward or easy. And, because your roof is such a large investment it is important to put some thought and consideration into the decision-making process. Check out some things to consider to help your decision making process simpler. While you should always be looking for quality roofing material, it is essential to be realistic about your budget. Determining a budget for your roof early on will help you set expectations. Keep in mind that the pricey materials aren’t always the best, so be sure to ask your local roofing contractor about the specifications of the materials they carry. Your roof is responsible for protecting against the natural elements and other damaging factors. That is why it is essential to choose a material that can offer protection for years to come. Consider how long each material is projected to last and how it stands up to certain elements and factors. Again, your roof is a big investment, so you want to ensure you are picking durable and long lasting materials to get the most out of your roof. The slope of your roof is a measure of its steepness. This is important to consider when choosing a roofing material, as not all types perform the same on different slopes. For example, tiles are not an ideal choice for low-sloping roofs, but flat roofing is. Before selecting a roofing material, consider the slope of your roof and choose a material that looks and performs best on said slope. Your roofing system plays a large role in your home’s curb appeal. When choosing a roofing material, it is important to consider the appearance of the material and how it looks on your home’s existing exterior. There are a variety of styles and colors available, so pick one that fits your home’s architectural style and existing exterior elements, and choose a roofing material that ties the aesthetics of your home together. 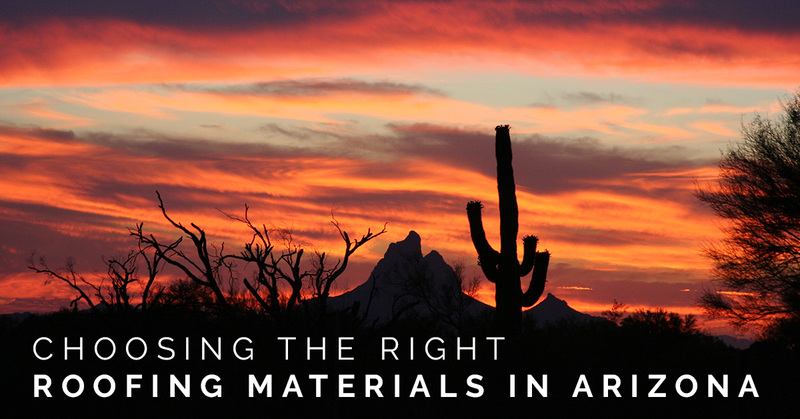 When homeowners in Arizona face the challenge of selecting a roofing material that can withstand the extreme heat that often scorches the Southwest region. When you are comparing roofing options for your home, you want to pick the one that is not only durable, affordable, and made of quality materials, but you want a material that will help keep your home cooler during the summer months and protected from the monsoon rains that typically occurs between July and mid-September. Let’s take a look at some of the most common roof types that our roofing contractors in Mesa often install. Tile roofing is one of the most popular roofing materials used for homes in Arizona. In addition to the high-quality timeless appearance, tile roofing is extraordinarily durable. Tile roofs are typically made from clay, concrete, or slate and the tiles themselves can last over 75 years. At Express Roofing, we carry and install a variety of concrete roofing tiles. Concrete tile roofing can replicate more high-end types of roofing — such as wood, stone, or slate roofing — but typically concrete tiles are considerably a more affordable roofing option. Concrete roofing tiles are great insulators for both hot and cold clients, and they are fireproof, which is a big bonus in Arizona, where extreme heats can lead to a fire. At Express Roofing, we carry both Eagle Roofing and Boral Roofing products. With a wide collection of textures, dimensions, profiles and shaped and flat roof tiles, finding the right tile roofing material is much easier with the help from our roofing company. Shingle roofs are another roofing material that is also popular in Arizona as well as in areas across the nation. This roofing material has become popular for their durability and longevity, as well as their affordability. Shingle roofs typically last longer than most kinds of roofing, and is often the material that most roofing contractors will recommend due to the various designs, styles, and patterns that they come in. While there are two types of roofing shingles, 3-tab shingles are what you likely see the most. Architectural shingles, on the other hand, are thicker and have more depth to the way they look. Whichever style of roofing shingles you decide to choose for your home should largely depend on your budget as well as the value of your home. At Express Roofing, we offer homeowners a large selection of quality shingle roofing materials from some of the leading manufacturers in the nation. With names like GAF, TAMKO, Malarkey, and Owens Corning roof shingles, you will be sure to find the perfect fit for your home. Flat roofs are becoming a very popular roofing material in Arizona. Foam roofing is one of the most popular flat roofing options, and it is continuing to become more popular because of its functionality and energy efficiency. Over 90 percent of flat roofs in Arizona are sprayed with polyurethane foam. Roof foam coverings are quick and easy to install, without requiring the need to remove an existing roof. Foam roofing is waterproof, light, easy to maintain, and are made of an elastomeric material that screens off ultraviolet rays from the sun. Considering the factors and popular types of residential roofing will make your decision making process much easier. When selecting the right roofing materials, choosing the right roofing contractor to work is just as important. If you are still having trouble selecting the right roofing material for your home, your local roofing contractor will have the knowledge and expertise to recommend some of the best types for your home. When it comes to roofing companies in Mesa, Phoenix, and the surrounding areas, there is not a better team to trust your roof with than Express Roofing. We have helped install, repair, and replace countless residential and commercial roofing systems throughout Arizona. To learn more about our roofing services, contact our team of friendly roofing contractors today!